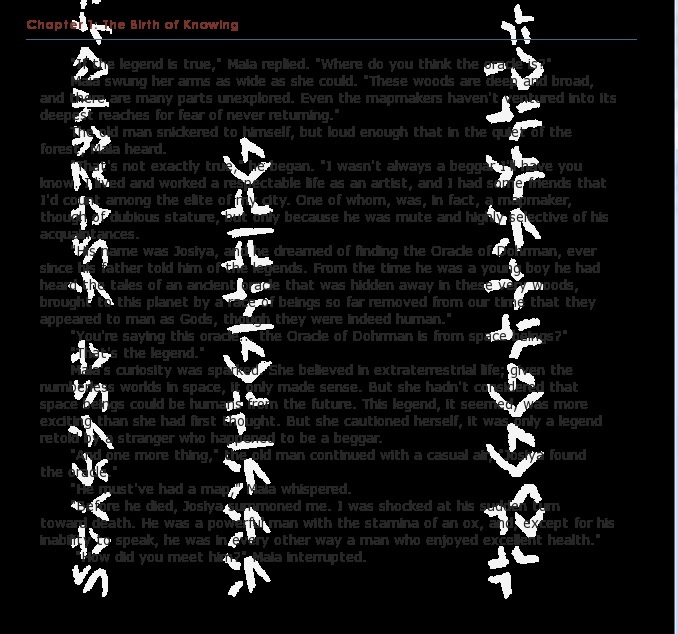 found the attached symbols imprinted on every page of the book. They are the same symbols throughout. In the Ancient Arrow as well only slightly different. None found in Quantusum... All this through the Spiritstate site. I will double this post on the Ancient Arrow section as well. Probably, it would be kind of Digital Watermark. However, this is very mysterious…indeed. I feel somehow genetic images from these symbols. Wow, yours are different than mine!! I hope that doesn't mean we have to get everyone having access to the books to do the same so as to figure this one out! Did you try the other book so as to check resemblance? Mine was different in only a handful of symbols..
Actually this issue had discussed on this forum in 2011. It seems there are a couple of patterns in terms of “symbol sets”. I understand the fact that it would be a fail safe for not copying, something that must have changed as an approach with the next books as the watermarks aren't there. It would even be able to track down who uploaded the content as the symbols are uniquely placed on the page for each reader. So you doubt it is actually meaningful in any fashion? Many forum members feel the connection with chromosome. Above images contain abnormal chromosome.